London based designer Sarah Turner created her eco-friendly lights in an effort to provide home interior design by re-purposing waste materials. Her eco-designs have won awards at the EDF Energy Ideal Home Show and Make Some Green Competition. From tables, convertible couches and double sink designs her most popular products have become her lamps. The ReDesign Drinks Bottle Lights use a variety of plastic water and soda bottles as combined lampshades. Mainly, constructed of several plastic bottles cut into a flower style design. The standard is using clear or white bottles but Sarah does have a variety with blue and green cut plastic bottles as well. The plastic boxes are first collected, cleaned and sandblasted. Once they have been smoothed from blasting, they are then cut into a design shape. Each plastic bottle is screwed into the cardboard and then secured on the inside with the plastic lid that originally came with it. The current popular design for Sarah’s lamps are the Coca Cola 30’s. The Cocoa Cola 30 design is created from thirty plastic reused bottles that surround an inner base made up up recycled card. This shade isavailable in either the table lamp, pendant ceiling and floor lamp styles. The design is also based on an maximum of 20W energy saving bulb, due to the nature of the structure a higher wattage is not recommended. Other lamp styles available are the Cocoa Cola 10 and the Little Oasis. The Cocoa Cola 10 has the same design as the Cocoa Cola 30 but use ten larger plastic bottles for the shade design. The Little Oasis is a table lamp created from a single Oasis plastic drink bottle and is approximately 100 x 250 mm in size. Also, the Little Oasis will take a maximum of 3W energy saving bulb and currently has not been made available for sale. 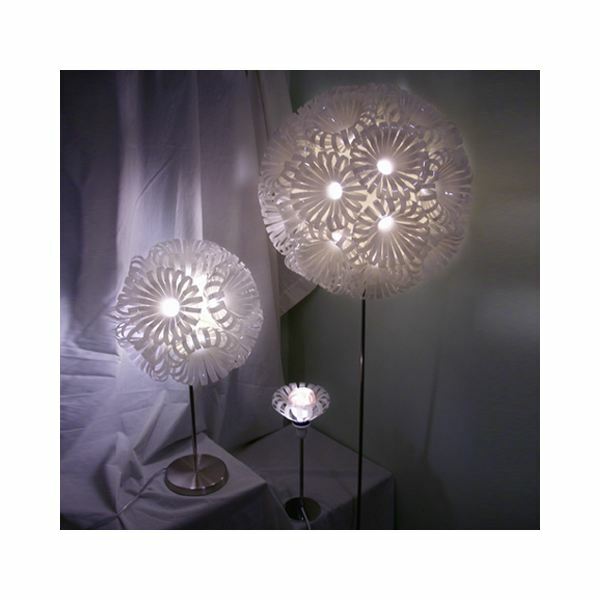 *Image of three lamp designs courtesy of Sarah Turner. Lamps shown are the Cocoa Cola 30, Cocoa Cola 10 and The Little Oasis.